Vienna-based architect Martin Feiersinger and his brother, artist and photographer Werner Feiersinger, have traveled extensively across Northern Italy in order to document the region’s modern architecture after World War II. 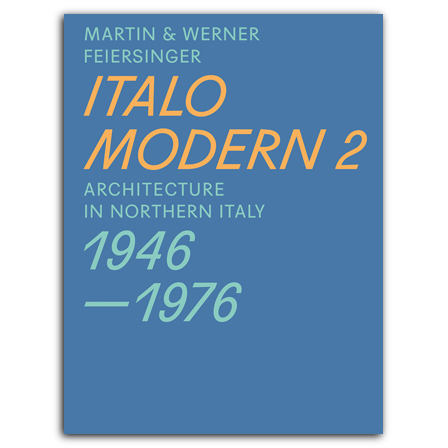 Italomodern 1 and 2 are the result of their travels, the most authoritative survey of Northern Italy’s architecture between 1946 and 1976. In their study, they have focused exclusively on distinctive buildings rather than entire urban structures, and they have selected the included projects as exemplary representations of neorealism, rationalism, brutalism, and organic styles. Italomodern 1 features 84 buildings and Italomodern 2 contains an additional 132 buildings. All of them are represented with photographs, a concise text, the exact address, and selected floor plans, sections, or elevations. The images present a subjective point of view, showing each building in its present state. An appendix provides rich information on the architects and other selected buildings and further reading for each firm. The books offer a glimpse into an era when society’s aspirations found expression in the built environment. Each volume is self-contained and also makes an insightful and useful guide for architecture lovers and travelers.